Rabbits do find vet trips stressful but seeing a rabbit-savvy vet is vital for their long term good health. As prey animals rabbits will often only show their symptoms when they are severely unwell and there are times when it can simply be a matter of life or death. If you have any doubt over whether or not you have an emergency, the safest thing to do is to assume you have and see the vet immediately. This is ALWAYS an emergency. Don’t delay a second. 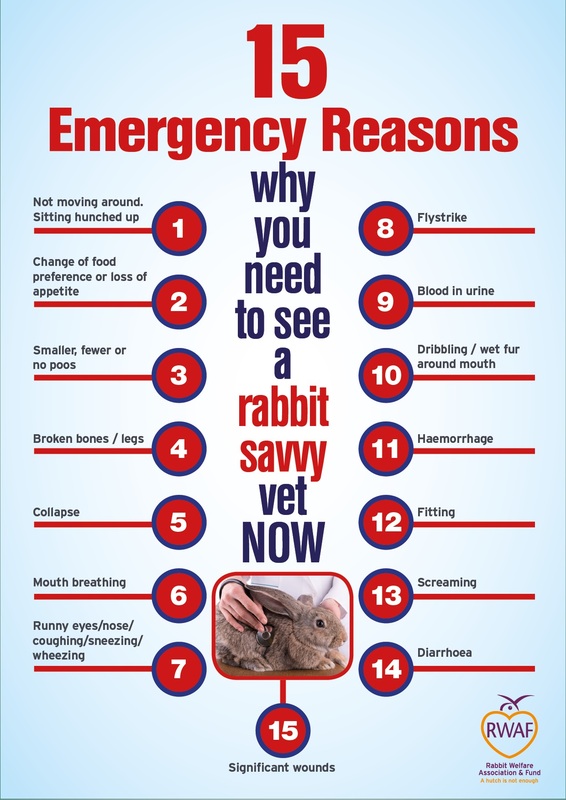 If maggots can be seen, a vet needs to see your rabbit at once. DON’T wet the fur. The vet will need to clip and can’t clip wet fur. And you haven’t time anyway. Those maggots will be eating your rabbit. Your rabbit will be in pain and will be suffering from gut slowdown. Your vet needs to assess the cause and to give appropriate medication to get the gut moving. This must be done quickly. Your rabbit should see a vet within the shortest possible time. ‘Tomorrow’ will be too late. Don’t give gut motility drugs, even if you have some at home. If there’s a blockage, you will cause a rupture which will kill your rabbit. The vet will know what it’s safe to give. Rabbits are nose breathers. If they are mouth breathing there is severe distress and your rabbit must see a vet at once. Unless this receives immediate treatment, particularly pain relief, your rabbit will suffer the added complication of gut slowdown. Some may even die from shock. Often collapsed rabbits will be very hot or very cold, depending on the cause. In case there is spinal damage, lift your rabbit very carefully into a carrier and use straw or blankets to help keep it steady while you travel. If you suspect heatstroke, put an icepod on the OUTSIDE of the carrier. Don’t try to get the temperature to drop too quickly. Likewise if the rabbit is very cold, put a heat pad on the OUTSIDE of the carrier to help raise the temperature gently. Usually blood in urine will be in spots. Don’t be panicked by red urine if your rabbit seems fine otherwise. It can be stained by what they have eaten. If there is any sign of straining while attempting to urinate, and especially with blood or spots of blood visible in urine, immediate treatment is essential. If this is from a wound, apply firm pressure to the area and get to a vet. If it’s from an orifice you cannot apply pressure, but nevertheless, it’s an emergency and a vet is needed at once. The severity varies, but remove any visible hay etc from the vicinity of the wound and go straight to the vet for cleaning and probable stitching as well as pain control. We hope you never hear this from a rabbit. If you do, there is a reason. Examine your rabbit fully and you will usually find a wound or else evidence of an internal and very painful problem that needs immediate veterinary treatment. If your rabbit is producing watery or jelly-like faeces, and is hunched up, looking miserable, veterinary help is needed at once. 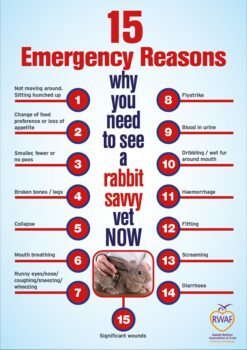 This is especially important with younger rabbits, particularly those that have recently been weaned. If the rabbit is alert but has diarrohea, it’s possible to wait until the next normal surgery hours, provided this is within 12 hours. If your rabbit fits for a long time, its body temperature can rise and that is very dangerous. You should make sure your rabbit cannot hurt itself on anything hard or sharp, and phone your vet immediately. If you need to take it to the vet then pad out the carrier with rolled towels to keep your rabbit steady. You should always stay as calm and quiet as you can on the surface to avoid further stress, even though you may well be panicking inside.